Sometimes, you just gotta have a big, juicy, manly, hearty burger. Last week, I had one of those days. So I put together this Blue Cheese Burger Recipe that was seriously out of this world. Each burger came out to just 9 Points, which wasn’t bad considering how big and satisfying it was. I probably could’ve used a sandwich thin, or some other low carb hamburger bun, and shaved off an extra Point or two, but this time, I needed something BIG and carb-y. So I went with a thick, hearty, whole grain hamburger bun from Udi’s. The meat was so juicy and flavorful, and the pungent blue cheese was the most perfect complement. The next time you need a burger that is so divine it feels NOTHING like diet, food, this Blue Cheese Burger is your ticket! 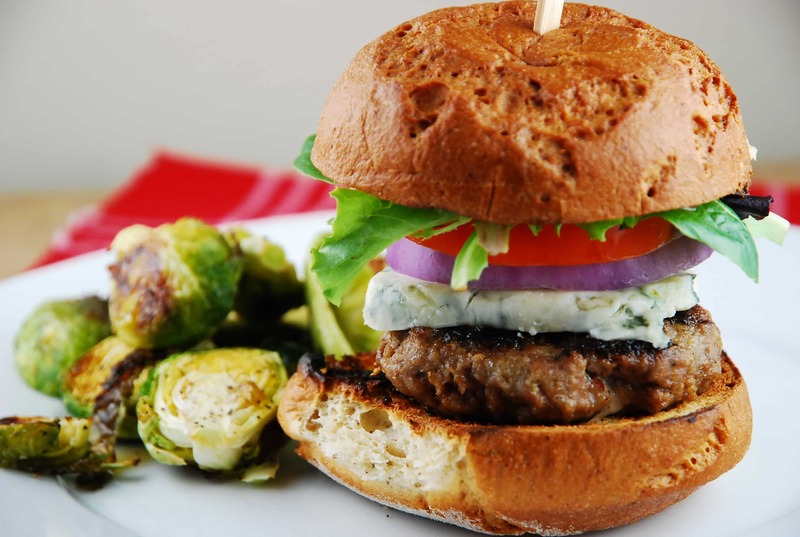 A gourmet blue cheese burger that tastes incredibly decadent, and is extremely satisfying, this Weight Watchers recipe is a real winner. Much lower in fat and calories than the restaurant version, and a breeze to prepare. In a medium sized bowl, using hands, mix together ground beef, onion powder, garlic, Panko, egg substitute, and salt & pepper. Shape into 8 patties. Preheat grill or heat a nonstick skillet over medium high heat, and mist with cooking spray. Cook burger patties until browned on both sides and cooked through, about 4 minutes per side. Remove burgers from skillet or grill. Lightly mist the insides of the buns and place them facing down, on the same pan. Cook until the insides of the bun are toasted, about 2 minutes. Assemble burgers by placing the meat patty on the bottom bun half, top with blue cheese, red onion slices, tomato slices and a few green leaves. Spread about 2 tsp mustard on the top bun half, and place on top.